The ladies from the “Skinny Latte” line are back! Today’s stamp set is one of those exclusive, hostess-only sets that can only be purchased by my hostesses. When you host a CTMH class or workshop with me (in-person or online), you will not only have the opportunity to earn a bunch of FREE products, but will also have the opportunity to purchase some deeply discounted, hostess-only stamp sets! The “Better with a Friend” stamp set features 5 large stamps. How adorable are these ladies?! To learn how to get your set, please click HERE. This 5″ x 7″ card was made with a White Daisy card base and a Pear cardstock front. The beautiful pink patterned paper is from a new paper packet called Brushed. The yellow cardstock strip is also a new color, called Canary. The ladies were stamped in Black ink and then colored in with watercolor pencils. Once all of the sections were colored in, I went back over each color with a blending pen to soften and get the watercolor effect. 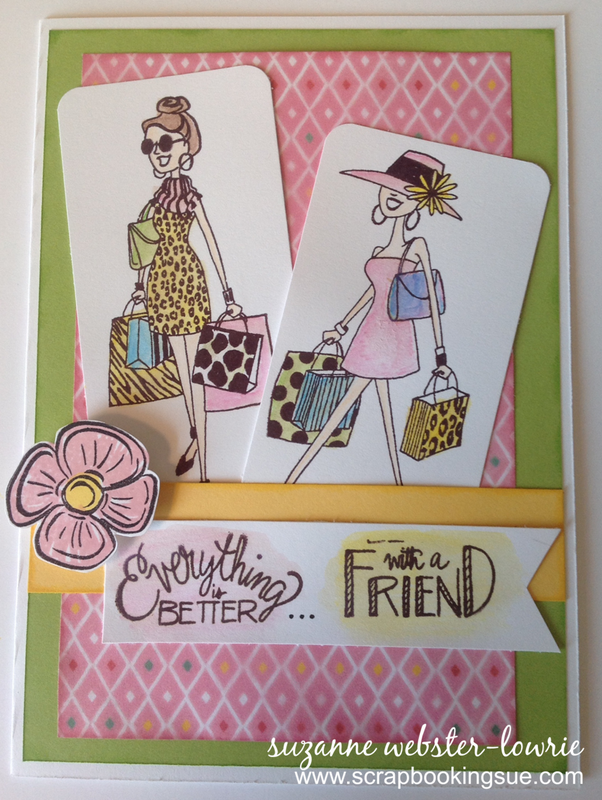 The sentiment “Everything is Better with a Friend” does not look like I stamped it. If you scroll back up the page to a picture of the stamp set, you’ll see that the words are stacked on top of each other. Using a masking technique, I stamped “Everything is Better,” added 3 dots with my black pen, and then stamped “With a Friend.” I colored over the two sentiments with watercolor pencils and then blended with my blending pen. The pink flower was from a different stamp set called “A Budding Friendship.” It was stamped with Black, Pixie, and Hollyhock inks, and then a piece of foam tape was added to the back to pop it off of the page. I will be linking this card to the Mojo Monday Challenge #357, found HERE.